Last week I made soft and chewy peanut butter cookies, with chocolate chips. They came out SO good. If you want to try an alternative to the more traditional crunchier type peanut butter cookies – this’ll do ya. In medium size bowl, combine flour, baking soda, and salt. Set aside. In large bowl, combine butter, peanut butter, brown and white sugar until creamy. Stir in the corn syrup, water, and vanilla. Gradually stir in the flour mixture. Stir in chocolate chips. Place loaded teaspoons of the dough on ungreased cookie sheets. Even when the dough is soft these cookies do not spread, so if you want your cookies a little flatter, pat each teaspoon of cookie dough down into a flatter cookie shape before baking. You can leave each drop of dough as is if you want them a little bumpier and irregular. 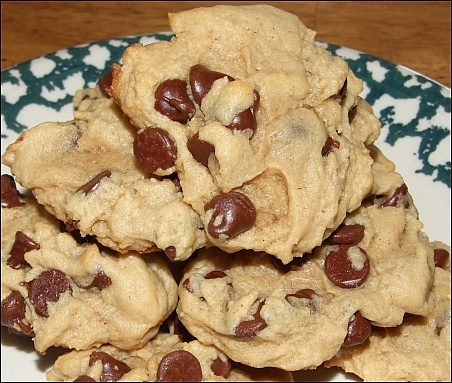 Bake each sheet of cookies for 9 minutes or until the edges are golden brown. After baking, cool for 1 minute on the cookie sheet, then transfer the cookies to a wire rack to finish cooling.